After a decades-long effort to place ideologically committed “movement” members in the judicial branch of government, funded by extremely wealthy individuals and their corporations, it looks like the resulting corporate/conservative wing of the Supreme Court is ready to make a ruling that would bankrupt public-employee unions. And clearly already-decimated private-sector unions will be the next target. 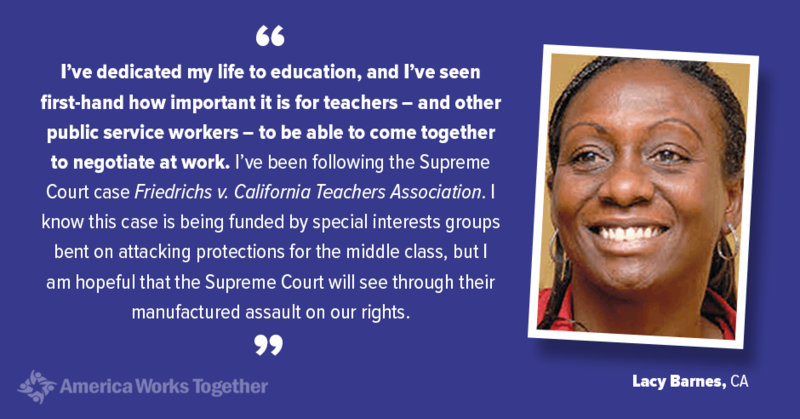 The Supreme Court heard oral arguments Monday in the case of Friedrichs v. California Teachers Association. In this case the Court is asked to overturn a unanimous 1977 case that said public-employee unions can charge nonmembers a fee to cover the cost of the services the unions are required by law to provide those nonmembers. The fee does not cover political activities of the union, only the cost of services the unions must, by law, provide. If the corporate/billionaire class gets its way – and it looks like it will – the terrible inequality you see in the country today is nothing compared to what’s coming. Having grabbed all the income gains since the recession, having wiped out the middle class, having pushed so much to the top that a few families now have more wealth than all of the rest of us combined, now the corporate/billionaire class is coming after the rest of the money in the economy. Conservatives are making the case that any services public-employee unions provide – such as collective bargaining, administering resulting contracts and representing employees who have grievances under the contracts – are themselves political. Because unions represent working people, enabling them to band together and collectively bargain, thereby gaining strength to confront those with concentrated wealth and power on a more level playing field, they argue these services are “political” services. And since public-employee unions bargain with the government, they argue that negotiating for better wages is “political” because better wages for public employees “cost taxpayers.” Therefore, by their very nature unions are engaging in “political activity.” So, they argue, those fees charged to non-members for the services the unions are required by law to provide are “political” services and can’t be compelled. If these fees that cover the costs of those services are struck down, however, the unions will still be required to provide the services. Obviously the purpose of such a ruling would be to bankrupt the unions. While comments made by justices in oral arguments are not always predictive of what a final ruling would be, the court’s conservative majority left the clear impression that a majority of the justices are preparing to rule against the unions. The court’s more conservative justices sharply criticized the current system in which public employees … must pay for the cost of collective bargaining, even if they disagree with their unions’ demands. The problem, those justices said, is that virtually everything the unions do affects public policy and tax dollars. A majority of the Supreme Court seemed ready Monday to agree with a group of California teachers who say it violates their First Amendment rights to be forced to pay dues to the state’s teachers union. A 40-year-old precedent allows states to permit unions to collect a so-called agency fee from non-members to support collective bargaining activities, and California is one of about 20 states that allow it. Public employee unions say such fees are essential to their well-being, and that challenges to the arrangement are born of conservative efforts to weaken their strength. Liberal justices during an hour and a half of oral arguments said the challengers had not supplied the kind of evidence required for the court to overturn a precedent. But the court’s conservative majority in 2012 and 2014 expressed grave doubts about the 1977 decision in Abood v. Detroit Board of Education, and there seemed little reason after the oral arguments for unions to think the majority was not ready to now finish it off. Bradley isn’t the sole conservative philanthropy to bankroll CIR. Others have included Donors Capital Fund and Donor’s Trust, two vehicles frequently used by the Koch brothers; the Dunn’s Foundation for the Advancement of Right Thinking; the F.M. Kirby Foundation; the Lillian Wells Foundation; and the Carthage Foundation, according to Conservative Transparency, a project of the liberal opposition research nonprofit American Bridge. 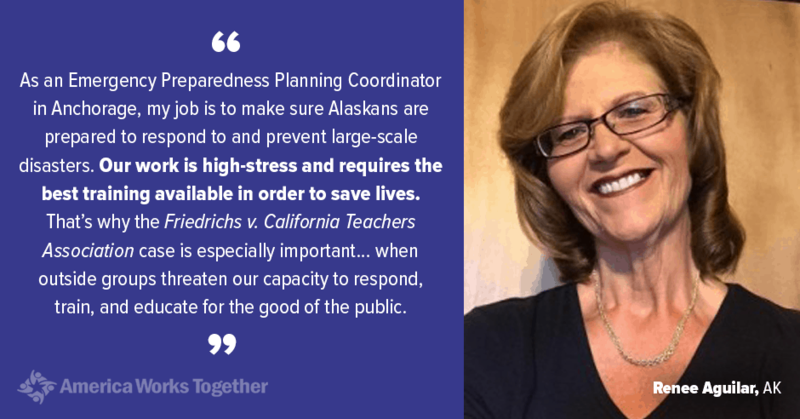 … Groups submitting amicus briefs in Friedrichs that received funds from Bradley include the Cato Institute, the Manhattan Institute, the Institute for Justice, the Beckett Fund for Religious Liberty and the Mackinac Center for Public Policy. It has been nearly 18 years since Hillary Clinton used the term “vast right-wing conspiracy” to describe the conservative forces arrayed against her husband’s administration. But the suspicion about right-wing plotting remains as current on the left as, well, Mrs. Clinton. … The center is backed financially by a number of prominent conservative foundations, and the case has generated considerable interest on the right. Conservative organizations and politicians, some of whom have received funding from Koch Industries and Charles and David Koch, have submitted more than one dozen amicus briefs in support of the plaintiffs. [. . .] The Center for Individual Rights is embedded in the world of prominent conservative political donors as well, having received large contributions from the Sarah Scaife Foundation, the John M. Olin Foundation, and the Lynde and Harry Bradley Foundation, according to filings with the Internal Revenue Service. As the U.S. Supreme Court’s 2014 session comes to a close, one of the major cases left for a decision is Harris vs. Quinn, which could affect millions of public sector workers in the United States. The case originates in Illinois, where home health care workers have been successfully organized by public sector unions. Now, a small group of these workers, represented by lawyers from the National Right to Work Legal Defense Foundation, have sued and their lawyers contend that the agency fees, or the fair share dues that even non-union members of a bargaining unit are required to pay to unions that bargain for higher wages on their behalf, violate the First Amendment. [. . .] In 2012, the Kochs’ Freedom Partners group funneled $1 million to the National Right to Work Committee, while the Charles G. Koch Charitable Foundation gave a $15,000 grant to the NRTWLDF, which has also received significant funding from the Koch-connected DonorsTrust and Donors Capital Fund. Today, at least three former Koch associates work as attorneys for the NRTWLDF. … In addition to the Koch brothers, the NRTWLDF has received significant funding from many big name conservative donors, including the Walton Family Foundation (of Walmart), the Coors family’s Castle Rock Foundation, Wisconsin’s Bradley Foundation, the John M. Olin Foundation, and the Searle Freedom Trust. And they represent the very people who will gain the most from the resulting increase in inequality and plutocracy that will result from the destruction of unions and the bargaining power they provide to regular, working Americans. Ordinary people can’t lobby the Supreme Court, but together we can change the political and cultural climate that the Supreme Court operates in as it makes its ruling. We can send a message that working people do not accept an economy in which they cannot organize together to fight for fair wages, working conditions and the ability to do their jobs effectively. One way to do that is to sign this petition that declares that “it’s time to stop attacking working people.” Then check the America Works Together website for facts and framing you can use on social media, in letters to the editor, and in conversations in your community.